MarsEdit at http://www.red-sweater.com for $39.95 from Leo Laporte. Sumo Beanbag Omni Chair at http://www.sumolounge.com for $150 from Chris Breen. Padilicious.com at http://padilicious.com for free from Andy Ihnatko. Air Sharing HD for iPad for $9.99 from Andy Ihnatko. GoodReader for iPad for .99 from Merlin Mann. 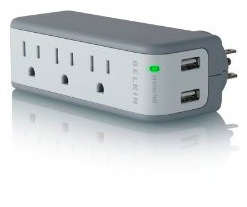 Belkin BZ103050vTVL Mini Surge Protector/Dual USB Charger for $12.24 from Merlin Mann. Incase 2-amp Car Charger for iPad/iPhone/iPod – Black for $24.95 from Leo Laporte. America’s Hidden History: Untold Tales of the First Pilgrims, Fighting Women, and Forgotten Founders Who Shaped a Nation ($10.87) from Andy Ihnatko. I do not second guess Andy’s judgment on anything lightly, but I have to disagree with his dismissal of Goodreader in favor of Air Sharing HD. The interface is not as polished as the best apps out there, but I think “stupid” goes too far. And nobody mentioned what, to me, is the feature that got my attention in the first place: with pdf files, it can pull a sort of Instapaper trick and strip out the text into an easy-to-read continuous column. I read a lot of text-heavy pdf files (academic journal articles) and this is such a killer feature for me. With the Dropbox integration, Goodreader would appear to do most or everything that Air Sharing HD does, only with a homelier interface and an extra awesome feature, for 1/10th of the price. To be fair, I haven’t used Air Sharing HD, so I certainly could have missed something important. But I hated to hear Goodreader get short shrift. It would be great to modify the Padilicious script to have it create an iPhone-compatible gallery.